Photo courtesy of Wide Eyes Open Palms. All other photos by Asia Morris. Angie Evans and Kat McIver, the dynamic duo behind Wide Eyes Open Palms (WeOp) and what has been a staple pop-up coffee and pastry shop at several of Long Beach’s farmers markets over nearly the past three years, announced this week that they have finally found a home for their business. And it’s certainly time to expand. During their busiest farmers market days, usually Tuesdays and Sundays, Evans says she serves beverages to hundreds of people, while McIver whips up 70 dishes in five hours, which is no small feat using a propane camp oven on a folding table. The two have been relentlessly making it work, and then some, with not only their farmer’s market presence, but by catering private brunches and collaborating with local businesses throughout Long Beach, including Rose Park Roasters and Sura Korean BBQ & Tofu House. 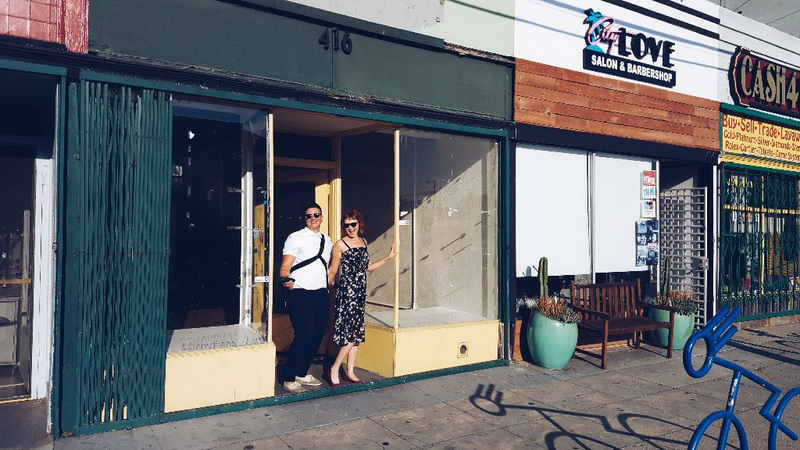 What will be WeOp’s first brick and mortar is “600 square feet of 1930s paradise” and located just off of 4th Street’s Retro Row at 416 Cherry Avenue, nestled between City Love Salon & Barbershop and Cherry Smoke & Skate. It’s located in their neighborhood, of which Evans has been a part of for a solid 10 years and as frequenters of what seems like one of Cherry Avenue’s unactivated blocks, when they noticed the for-lease sign they jumped at the opportunity. The pair hopes to open before the end of the year or by early 2017, but are honest in saying they’re simply not sure of the exact date. And while they may have to temporarily put a hold on their pop-up operation, they certainly plan to resume once their latest endeavor is up and running with a full team. “To continue to be an outlet for people that are going to the farmers market, that’s important to us,” said Evans. But once the two do open their doors, expect a full espresso menu, pour overs, cold brew beverages, in-house pastries and a farmers market-centered brunch menu to be available seven days a week. Evans says WeOp will be the only coffee shop in Long Beach to make their pastries in-house, notably with all organic ingredients. According to their e-letter, they’re financing this next big step, which includes turning a deteriorating retail space into a functioning food establishment, through the business’ funds, loans and the investments of a few devoted WeOp supporters. They said they are also offering the opportunity to invest to one more person who is passionate about sustainable food and coffee. For more information about WeOp or to contact the business, visit their Facebook page here or website here.